A packraft is the perfect accomplice for weekend expeditions. About a year ago, I was in Red Canyon on the Green River in far northeastern Utah, wrapping up fieldwork on my upcoming guidebook Paddling the John Wesley Powell Route. What began as a self-funded personal passion project had recently ballooned into a full-color inspirational book for FalconGuides, with photos and history paired with essential planning info. Now, I was rushing around, like a river-running pizza deliveryman, trying to finish the photography and field research before the looming deadline. In stages over four years, I paddled or rowed about a thousand miles of river and lake. From Flaming Gorge Reservoir in Wyoming, through amazing canyons in Utah and Arizona—with names like Desolation, Cataract, Marble, plus the best of all, Grand Canyon—and into Lake Mead in Nevada. Much of the route is long segments of flatwater disrupted by sections of exciting class II to IV whitewater. During the final stages of fieldwork, I increasingly retraced accessible portions of the route along the shore, by foot, bike, and truck, to gain different angles for the photography. Which is how I found myself in Red Canyon, with a bit of a first-world paddling conundrum. I was at Spillway put-in, just below Flaming Gorge Dam. Not paddling but hiking the Little Hole National Recreation Trail. Yes, that’s a thing. Frankly, the trail has seen better days, with many sections of boardwalk washed away leaving hikers to walk on the foundations—piled stones retained by chain-link cages. Regardless, the trail surface is decent enough and follows at river-level through the 7-mile A Section, which is one of the most scenic gorges along the Powell route and in the Southwest. It’s a run well-known among fly fishermen for the year-round dam releases of cold clear water, but lesser known as a perfect class II+ river for a weekend of paddling. So, I’m hiking along the river during a weekday in late summer. Sort of jumping out of the bushes like a photographic stalker to capture dramatic candids of fishing drift boats, which looked to me like phantoms from Powell’s 1869 expedition. Meanwhile, I’m thinking, I want to do a run. I had my hard-shell kayak, but I didn’t have the funds to hire a driver. I didn’t have a road bike for the 20-mile shuttle, nor a great place to lock it up. I didn’t have more than a day before heading to the next objective. What I needed, I realized, was a packraft. Then I could do it all. Hike the trail, run the river, and gain even more perspectives in my photos. But I was hesitant. Was this one realization worth investing in an entirely new sport? Full disclosure, I suffer from GAS—gear acquisition syndrome—a bank-account debilitating condition that many adventurers live with despite (or possibly because of?) their dirtbag lifestyles. My strain is particularly related to paddling. I own 5 hard-shell kayaks—a river-runner, a creek-boat, two hybrid-touring boats, and playboat—plus an oar raft, paddleboard, and ducky. Currently, they’re strategically spread across the country, in the garages of friends and family in four states where I regularly work, roughly along the 38th parallel. Another reason for the geographic fragmentation, they won’t all fit in my truck at once. A packraft, by its compact nature, sure seemed like an easy choice. Plus, I hike and walk all the time, and I recently started backpacking again with my wife. But I didn’t have the time nor the money for long expeditions to exotic wildernesses—not now, at least. Were there other spots across the middle of the country, where I regularly work, which might yield short 1- to 3-day packrafting opportunities? The next idea came only a few weeks later. I was down on the Colorado River, just below Glen Canyon Dam. There’s a 15-mile section—the only river remnant of Glen Canyon not flooded by Lake Powell—nicknamed the “backhaul.” Due to security restrictions, there’s no public vehicle access near the dam, so a motorboat outfitter can be hired to backhaul paddlers and their craft upstream from Lees Ferry. 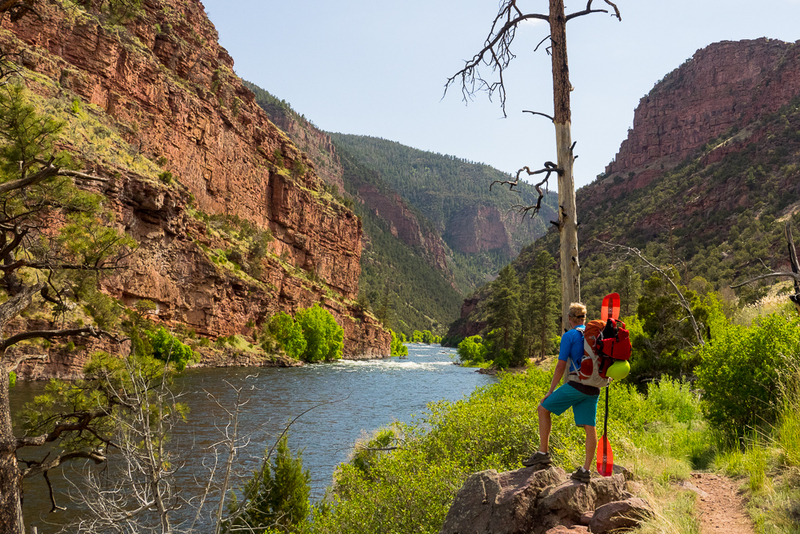 We whitewater boaters are often so focused on what’s downstream of Lees Ferry (the EFFing Grand Canyon), that it’s a common misconception that the dam is just upstream around the corner. I’d been curious about these final miles of Glen Canyon for years but never visited. Partly because the cost of a backhaul ride, while not outrageous, is less than ideal. Then I learned from a SUP guide in Page about another way into Glen Canyon. A few days later—with a new friend, a kayaking guide on Lake Powell—we hiked in on the Ropes “Trail,” which is more like a nontechnical rappel. Down a steep route, the middle third through a narrow crack, we carried an inflatable SUP and hardshell. The weight of the latter boat definitely pushed the trip into Type II fun territory (more fun after the fact)—especially when we started lowering the kayak blindly by rope, hoping it would land on ground and not water. It was nearly dark by the time we reached take-out at Lees Ferry, between the foot of the Echo Cliffs and the Paria River. Fourteen hours into our day, I was already convinced of two things. First, the final 15 miles of Glen Canyon are amazing—a class I float through sheer 1000-foot cliffs of orange Navajo sandstone, passing dry-falls stained by desert varnish, petroglyph panels, and the iconic Horseshoe Bend at river-level. And second? A packraft would have been a much lighter and better choice for the trip. And then I learned about the Spencer Trail, which rose steeply up from Lees Ferry to the top of the Echo Cliffs. From there, it was only six miles in a straight line across the plateau to the top of Ropes. Yes, in-between lay a region ominously called the Death Pockets, but it was probably after some really wealthy rancher named Johnny Death or something. Seriously, I probably should go around the Death Pockets and not through—but regardless, could these two trails be linked up to create a Lees Ferry into Glen Canyon Loop? I sure wanted to find out. While driving back east that fall, I passed the Nantahala River, which had just shut down releases for the winter. Hmm, I pondered, pulling into the Nantahala Outdoor Center parking lot. I hadn’t paddled the river in years, but I vividly remembered the regular backpackers passing through on the Appalachian Trail. We’d always chatted about doing a hike ourselves, but never made it happen. I went inside and grabbed a topo map and a description of the nearby trails. Sure enough, the AT rose steeply up from NOC to Cheoah Bald mountain. From there, a spur called the Bartram Trail dropped right back down to put-in for the standard 8-mile run. A difficult day-hike followed by a cool-water class II+ run back to NOC. Enough was enough. I was sold. That winter, I spent spare moments searching maps for the areas I frequent. Almost everywhere I looked—from the Southeast to the Ozarks to the Powell route to California—I saw awesome weekend expeditions perfect for a packraft that could slot into the free days I had here and there. Many were easier trips, just a few miles of trail and river, which could be done in a half day. Some looked more challenging, with a day or two of hiking to reach a day or two of river. Others would require ground-sleuthing to verify. I wanted to do all of them. So, I shared the idea with my editor at Canoe & Kayak Magazine. Soon we were developing the project into a new paddling-focused multisport blog series called Weekend Expeditions. A half-year into this sport, I can report that I absolutely love packrafting with the Kokopelli Nirvana I’m using for the project. I’ve pulled off the skirt for float streams and lakes. Sealed up the deck and dropped into class II and III rapids—next up I’m looking for some waterfalls and maybe strapping it to my mountain bike. The boat’s proved time and again, you can definitely surf a raft, especially one as stable side-to-side as this. I’ve hauled it over a mountain, along riverside trails, and next I’m flying it to Germany. We’re going to visit my wife’s family in her home village, but we’re sneaking off for a paddling weekend near the Alps with our cousin. I love the physical challenges of hiking the shuttle and logistical planning of backpacking with a boat. I’m burning less gas, reducing my CO2 output, saving money on shuttles. More than anything, I appreciate the flexibility and creativity it brings to weekend expeditions. It’s a welcome addition to my paddling quiver, and I can’t say I’ve ever looked back. Unless you count getting to see an amazing place like Red Canyon from the opposite perspective—hiking up the riverside trail just after another awesome run right down the middle. Mike Bezemek is a writer, photographer, editor, teacher—and now a packrafter. He’s the author of four books, including Paddling the John Wesley Powell Route (October 2018) and Paddling the Ozarks for FalconGuides. He is a contributing editor for Canoe & Kayak Magazine, does bikepacking articles for Adventure Cyclist Magazine, and writes the blog Hot Mess of an Adventure Writer Tells All: Confessions, Lessons, and Mishaps from Field (hotmessadventure.com). Connect with him at mikebezemek.com.